October 5, 2017 | 3:30 p.m.
Lots of people have multiple Bethel connections, but not many have a legacy like Peter Rekstad '85. His Bethel story began as a child growing up in New Brighton, Minnesota, surrounded by Bethel professors who went to his church and taught his Sunday school classes. Both his parents graduated from Bethel, and his dad earned a degree at Bethel Seminary, also working in alumni relations and development at Bethel in the 1960s and 1970s. Surrounded by all that Bethel influence, Rekstad chose Bethel too, pursuing a business degree, singing in the male chorus, and meeting his wife Beth (Carlson)'85, an education major whose parents also graduated from Bethel. But that's only the beginning. The Rekstads recently took an informal family inventory and estimate that at least 35 of their extended Rekstad and Carlson family members from three generations have attended Bethel. Two of the Rekstads' daughters—Britta '12 and Mikaela '15—graduated from Bethel, and the third, Krista, is a current student. Even a Rekstad dog, a Great Dane named Franklin, attends classes and lives on campus as a mobility service animal helping Krista. It's not that the Rekstads haven't looked at other places. Mikaela decided she was interested in going to school farther from home than Bethel and began researching other universities nationwide, using her family's familiarity with Bethel's programs to compare courses of study at other schools. As she researched, however, she realized that Bethel's breadth of programs offered multiple options in the event she changed her major, something she anticipated she might do. Mikaela chose Bethel. Then there's Krista, who never considered anywhere else. When asked what other schools she was looking at, says her father, she always replied, "I'm going to Bethel." A serious student, Krista has refused to let health issues get in the way of her education. With Franklin at her side, she has pursued her educational goals, and has found Bethel faculty to be accommodating and supportive. While the Rekstads have invested significant tuition dollars at Bethel, especially when two daughters attended at the same time (twice), Peter hasn't hesitated to support Bethel in multiple ways. 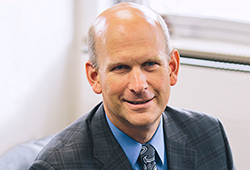 An investment professional who began his career at IBM, Rekstad has spent the past 28 years in his own practice, TruNorth Wealth Partners, managing portfolios for foundations and individuals. He brings those skills to his service on the Bethel University Foundation Board of Governors, a group of professionals that provides investment expertise in support of the Bethel University Foundation, which manages the university's endowment and trust assets established by donors. "My role on the Foundation Board is an intersection of service to Bethel and my professional abilities," says Rekstad. "I can take something I do in regular life and use those skills in service on the board." Rekstad often assists his own clients in giving gifts of stock, rather than selling it and giving the IRS part of the proceeds. His advice—which he lives by himself—is to use one's portfolio, rather than significant sums of cash, for charitable giving. In the 1950s, Rekstads and Carlsons chose to attend Bethel. More than 60 years later, Rekstad gives and serves because he recognizes that Bethel has provided him and his daughters—and dozens of relatives—with great academic programs surrounded by a strong spiritual influence. "The most distinctive thing about Bethel is the integration of great academics with a Christ-centered worldview," he says. "In all these years, that hasn't changed." Learn more about how a Stock Gifts can advance Bethel's mission .